Abu Dhabi Ports, the operator and manager of Abu Dhabi’s 11 ports and Khalifa Industrial Zone of Abu Dhabi (Kizad), has had a number of significant milestones this year, making valuable contributions to the emirate’s industry as a whole. The company has successfully adopted a strategy of partnering with global players in the industry, which has given Abu Dhabi Ports an even bigger opportunity to add value to the maritime and logistics sector locally, regionally and globally. Established in 2006, Abu Dhabi Ports’ core objective is to facilitate the diversification of the economy by stimulating trade and development. The flagship state-of-the-art Khalifa Port and Khalifa Industrial Zone of Abu Dhabi (Kizad) play a big role in supporting the diversification of the economy. 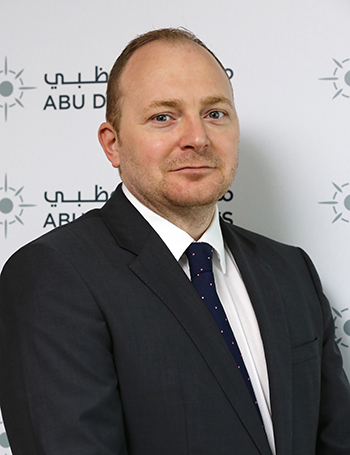 This has resulted in Khalifa Port, one of Abu Dhabi Ports’ key entities, developing into a major hub in the region and poised to be among the top 25 ports in container volumes in the very near future, Ross Thompson, Chief - Commercial and Strategy Officer, Abu Dhabi Ports said. “Khalifa Port’s capacity is set to increase from 2.5 million twenty foot equivalents (TEUs) in 2018 to 5.3 m TEUs by 2020, making Khalifa Port one of the top 25 ports worldwide in handling containers, beginning of next year,” he told the Gulf Industry. 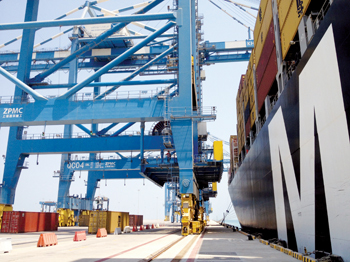 In response to the strong market demand for infrastructure development in the UAE, including airports, highways, rail and ports, Khalifa Port, the region’s first semi-automated port, is currently undergoing major expansion plans, in addition to developing the upgrades required to enhance the capabilities of the Port of Fujairah, Thompson added. In September 2017, Khalifa Port became the first ever port in the Gulf region to have Capesize vessel capacity through a partnership with Emirates Global Aluminium (EGA), which represents a massive dredging programme of the channel and basin areas. Cosco Shipping Ports Company Limited, in November 2017, broke ground in Khalifa Port signalling the start of construction of their new container terminal, which will increase the ports capacity to 6 million twenty foot equivalents (TEUs). The progress on this project is well on track and the terminal will be operational starting next year, he said. In addition, a new contract was signed with Cosco to develop the largest Container Freight Station in the region, further enhancing Khalifa Port’s value proposition to global and regional customers. February 2018 witnessed a strategic alliance between Abu Dhabi Ports and Autoterminal Barcelona was formed to create ‘Autoterminal Khalifa’. The 300,000 sq m car terminal, with more than 550m of dedicated quay, located in Khalifa Port, will provide a geo-strategic location for import traffic as well as communication with other main UAE cities. “The main short-term objectives are to provide the same level of quality that Autoterminal offers its clients in the Port of Barcelona, and to position Khalifa Port as the regional hub for all commercial trade routes in the Gulf, East Africa and the Red Sea,” Thompson said. As part of Abu Dhabi Ports ambition to make trade and shipping more efficient and streamline the exchange of data and information, Maqta Gateway Port Community System, the first purpose built digital system of its kind in the Emirates, was officially launched. The platform provides digital services to a variety of trade related entities including shipping agents, traders, custom brokers, freight forwarders, clearing agents, by providing a single window that links port and custom authorities, terminal operators, railways, airports, and industrial zone communities; in addition to other port community systems. While focusing on innovation, operational excellence and the expansion of infrastructure and services, Abu Dhabi Ports has successfully attracted foreign direct investment (FDI) into Abu Dhabi and therefore, the UAE. In fact, some of the recently announced major expansion plans are poised to give the shipping giant a solid footing for growth in the coming years. A 50-year agreement was signed with the Jiangsu Provincial Overseas Cooperation and Investment Company Limited (JOCIC), bringing investments of Dh 1.1 billion into Khalifa Port Free Trade Zone (KPFTZ), the largest free zone in the Middle East. The agreement will see the establishment of regions first approved industrial zone for companies from the Chinese province of Jiangsu as part of the global “Belt and Road Initiative”. China-UAE Industrial Capacity Cooperation (Jiangsu) Construction Management Co Ltd, a UAE company established by JOCIC, would develop 2.2 sq km of what will be known as the China-UAE Industrial Capacity Cooperation Industrial Park. The park will also be part of the KPFTZ and is expandable to reach 12.2 sq km. So far, JOCIC has announced that 19 Chinese companies from a wide spectrum of fields including energy, logistics and construction have signed agreements to invest in KPFTZ, totaling $1 billion in value. Abu Dhabi Ports signed a 35-year concession agreement with the Port of Fujairah to establish “Fujairah Terminals”, a new operational arm wholly owned by Abu Dhabi Ports, which will have the exclusivity to enhance existing infrastructure in addition to managing all container, general cargo, Roll-on/ roll-off (RoRo) and cruise ships in the Port. It further extends this exclusivity throughout the emirate of Fujairah for container business. The new Delma Port, one of the biggest in the Al Dhafra Region in the UAE, was developed by Abu Dhabi Ports with a budget of over Dh 170 million and covers a total area of 280,725 sq m to serve as a general, multipurpose port to handle cargo, passenger ferries and fishing vessels. An agreement was signed with Jalboot Marine, a local-based company that provides ferry services around Abu Dhabi, to begin cruise trips to the Louvre Abu Dhabi, in addition to other landmarks in the city. Another MoU was signed with Abu Dhabi Airports, for the provision of a first time in the region offering of airport check-in counters at Abu Dhabi Cruise Terminal. “These agreements come as part of the company’s efforts to enhance customer experiences and provide a variety of activities and attractions as we are always keen to play a pivotal role in further supporting Abu Dhabi’s positioning as a unique touristic destination,” he added. An agreement was signed with Shaheen Chem for the land lease of a two-phase chemical complex in the industrial zone with an expected investment of Dh 4 billion. The plant will support the UAE’s growing chemical manufacturing sector as well as supply major industrial giants such as EGA with raw material. Shaheen Chem Investment will also pioneer the production of ethylene dichloride in the UAE, showcasing Kizad’s role as an industrial hub for the country. At the same time, Abu Dhabi Port is taking new initiatives to keep up with the fast-paced industry and new market trends, Thompson said. “Customer needs and demands are forcing businesses to constantly adapt new business models. It’s these demands that create opportunities for companies. Automation and data are also changing the landscape forcing entities to adopt the latest technologies and come up with innovative solutions,” he said. As a response to these demands, Abu Dhabi Ports through Maqta Gateway recently announced its own blockchain technology entitled Silsal. This technology combines blockchain technology and unique digital identities to provide one, secure link between stakeholders in the trade community,” he added. Commenting on the market challenges, he said: “Market analysts have indicated that there is some slowdown in the market and competition from bulk carriers and container ship operators will continue to decline. 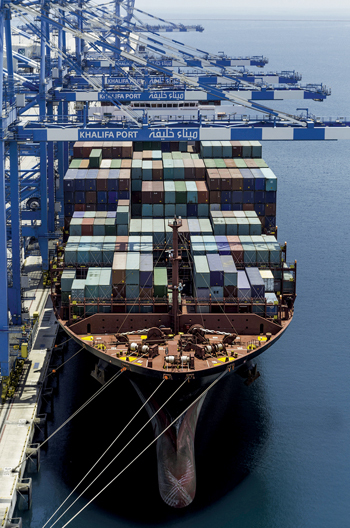 Furthermore, size, volumes and categories will change, and the real challenge will how port operators and equipment manufacturers respond to these changes.